SINTEPLAST, leading company in the Argentine market of paints and coatings, has automated its facilities in Ezeiza (Buenos Aires) thanks to a storage solution designed jointly by the logistics engineering ULMA Handling Systems and the storage systems company AR Racking. Founded 60 years ago as a company dedicated to paints, SINTEPLAST has expanded its business by commercialising architectural, industrial and automotive products, with more than 4,800 items distributed daily throughout Argentina. ULMA Handling Systems has designed and developed a comprehensive intralogistics engineering project. This project, together with the storage system designed and installed by AR Racking, will provide SINTEPLAST with a warehouse that will automate the reception of the products, the preparation of orders, and their dispatch. For SINTEPLAST’s facilities in Ezeiza, AR Racking has installed a single-depth clad rack warehouse. It is an installation in which the racking is part of the building structure, supporting the load of the stored goods as well as the external enclosures. The installation also has a high density miniload system, which uses robotic equipment for the direct manipulation of boxes and plastic buckets. The total surface of the installation is 65 m long by 46 m wide and has 10 corridors with racks. This project has reached a height of 38 m which allows a great use of space through the vertical growth of the warehouse. 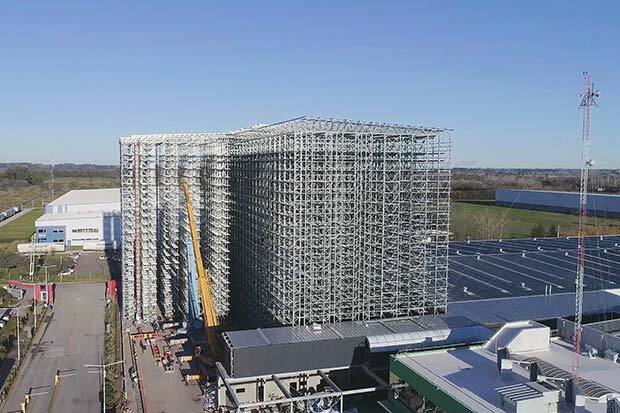 Thanks to this installation SINTEPLAST will reach the figure of 18,400 stored pallets and will increase its stock capacity to 13 million litres of paint. In addition, it will go from from handling 250,000 litres per day to 500,000 litres a day which will undoubtedly help SINTEPLAST to meet the needs of its customers and improve its service. Juan Francisco Contreras, Product Manager at AR Racking, says: “once this installation is completed, SINTEPLAST will increase its handling capacity by 100%, thus improving their customer service. At AR Racking it is our goal to help our customers to be more competitive installing solutions to suit their needs”. AR Racking is part of the Arania Group, an industrial group of companies of great experience and scope, with a multi-sectoral activity based on the transformation of steel that dates back more than 75 years. AR Racking provides the market with a wide range of solutions with high certified quality standards. It has a fully automated production plant and its own R&D&I technology centre. AR Racking has developed an innovative traceability procedure which means that beams and uprights have a unique identifying serial number. It also produces as standard all its racking in a pre-galvanised finish to ensure optimal storage even in extreme temperatures. Being part of a large steel group and having an in-depth knowledge of the composition and behaviour of materials give AR Racking high reliability when it comes to meeting delivery deadlines.